Preheat oven to 350⁰F. Cook bacon and reserve the bacon drippings. Set aside 15 of the best bacon slices and finely chop the remaining slices. 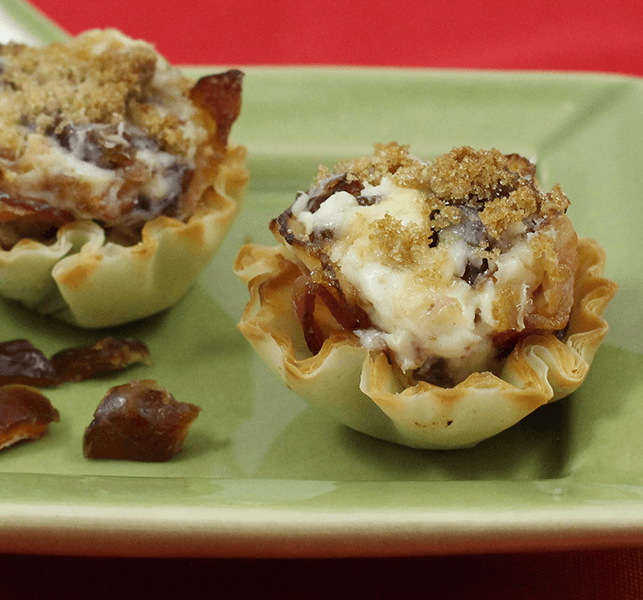 In a medium bowl, combine the cream cheese, bacon drippings, chopped bacon, salt and dates. Cut each of the bacon slices in half. Shape a heaping teaspoon of cheese mixture into a loose ball and wrap a half slice of bacon around it. 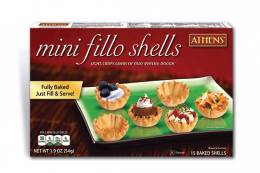 Place the bacon wrapped Phyllo mixture into each shell. Sprinkle each with a pinch of brown sugar. Bake for 8 minutes or until cheese is melted. Precooked bacon can be used for this appetizer. MAKE AHEAD: Filled shells can be wrapped in plastic and frozen. To serve, unwrap, sprinkle brown sugar and bake per directions. This mango-powered salsa goes great with our Cajun Scallops and our Phyllo Chimichangas. 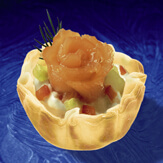 These appetizers feature salmon slices accented by sour cream and a cucumber salsa.